Oil on board, 24" x 30"
This is a recently completed commissioned work. Robert, a longtime family friend, wanted a painting of a barn he had renovated inside and out. The interior is certainly not your typical barn any longer. It has been outfitted with a concrete floor, kitchen, gallery lighting and much more. It is used for family gatherings, weddings, etc. Robert is part of a large and loving family of wonderful people who are highly respected and appreciated in our region. Brenda and I had the honor of attending their family gathering this year and unveiling the painting. I was given complete freedom in my interpretation of the subject. Later I was thrilled to learn that the view I happened to choose held special significance for the family--Robert's father and neice are buried under the two large pines at the top of the hill. 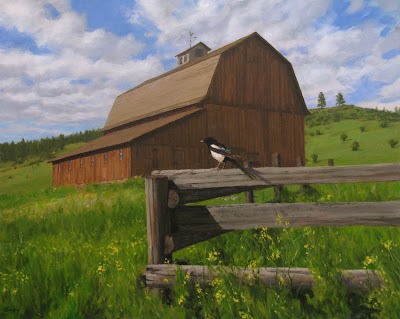 The neice, Jena, was a young aspiring artist who was working on a painting of this barn when she sadly passed away. This was a commission that held special meaning for me--thank you, Robert! Don, I'm completely amazed at the fact that you included the two pines without knowing how significant that would be to the family. Wonderful story. Gorgeous painting. I was amazed too, Silvina...whether dumb luck or guidance, it's fortunate that I settled on that view. Thanks for your thoughts--great to hear from you. Thanks, Anne. I think someone told me that farm once belonged to an Edvalson. And of course I recall it belonging to Wilbur Smith. It's interesting how places retain traces of previous inhabitants through collective memory. The style is slightly different compared against previous posts. Maybe it's because this piece is so much bigger and the painting is so tightly rendered. Very photorealistic but still very much a painting! Dean, I appreciate your comments. I think the style is pretty much the same--it's the scale of the work that makes it look more tightly rendered in the photo.